Perched high on a hilltop above the town of Las Catalinas on Costa Rica's pristine Guanacaste peninsula, Casa Chameleon Hotel at Las Catalinas promises an idyllic getaway. The property affords panoramic ocean views, minimalist contemporary design, and an incredible zero-edge infinity pool, along with a terrific sunset bar scene at Sentido Norte Restaurant & Lounge. 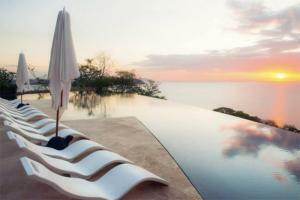 Each of the 21 private villas features a personal salt water plunge pool and ocean views. Those looking for adventure will find it right at their doorstep, with pristine beaches and warm waters perfect for swimming, snorkeling and kayaking. Turning your gaze toward land, you'll find over 1,000 acres of tropical forest, hills, and valleys. Experience the landscape on foot, bike or horseback. This resort is about a 45-minute drive from Liberia airport, and features a multitude of outdoor adventures.